It pours a cloudy dark brown, almost opaque with just a hint of deep ruby hues and a rich off white head. 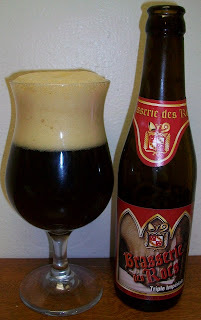 This has a very unique nose for a Belgian; sweet and rich roasted malts on the nose with notes of chocolate and caramel, with an interesting spice and all with a very yeasty background. Wow, I think this is the maltiest Belgian I’ve ever had. This is very rich, malty, smooth and creamy. The malts are like a stout but without the roasted malt bitterness, like a well crafted doppelbock but without the lager harshness. Man, I’m going to have to re-group here in order to attempt to explain this one. The taste starts out with roasted malt sweetness, then a rich malt coating over your tongue and whole mouth with the most creamy mouthfeel. The back end is, you guessed it more malty goodness with a little bit of spice on the finish. I can’t quite put my finger on that spice nor the complexity of the malt. There are notes of chocolate and caramel, no maybe that’s more like a toffee, anyway it is just incredible. The entire sip is just one long build up of malty goodness. It is somewhat surprising that with all this malt this beer is not syrupy at all. It stays creamy the whole way down. As this wonderful brew warms the caramel/toffee notes become a little more pronounced. Even at a warmer temperature this bier does not get syrupy, it maintains that same sweet malty creaminess. What a delightful brew. I had this at a tasting, just a few ounces in a tasting glass give you an idea but it doesn’t do this beer justice. You really can’t experience this on until you properly pour a whole glass. This is an A+ for me. I just can’t tell you how delightful this was. I highly recommend this bier to anyone that like a creamy malty brew. I would suspect any sweet stout or doppelbock lover would like this beer, the malts are characteristically very close. But this one also has that Belgian complexity that you get from those wonderful yeast strains. This is one remarkable bier.